Hello People, This is my first post so please be gentle. I thought I would share a few pictures of a site that is soon to be no more. It is of the little known South Marston airfield to the east side of Swindon. The airfield during the second World War produced Short Stirling Bombers, The Super Marine Spitfire and a host of other aircraft. The section I explored is of the old paint shop where they used to paint the aircraft. In recent years it was taken over by Crown Timber and now sits empty. Most of the old airfield is now home to Honda, but parts of the airfield are still very much evident today. Very soon property developers will pull it down to make way for new housing. I am certainly not a photographer and these pictures were taken on my phone so please excuse the poor quality (Sorry the pictures are dotted all over the place, I have poor internet connection here at work and just finding my feet on how this works). Nice one mate, didn't know there was anything there except Honda. Thanks. Never knew that there was more left of the airfield other than runway. On a related note, a picture I took of the spitfire that used to guard the Vickers gates at South Marston . 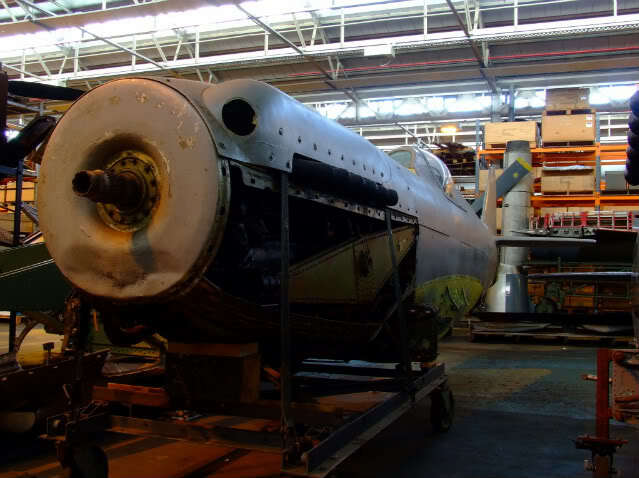 The Spitfire is in storage at MOD Stafford. I have never seen this before......too young Thank you for putting this up - I have always wanted to see this.....she looks a little sad! Some really artistic shots in there dude, I love the composition of 5, 11 and 12! Great first report and what looks like a good explore too! Is there a repeat in there on the shot of the stairs though? Thanks matey. I got there just in time as it has now been pulled down and is now a self storage place for caravans.